We have released a new version of Datamolino on Tuesday, September 8th 2015. We have improved many backend processes. We have also made one change that will make Datamolino even more useful for Xero users. In addition to the "ledger account" and the "tax rate" you can now assign tracking categories to your Xero transactions. 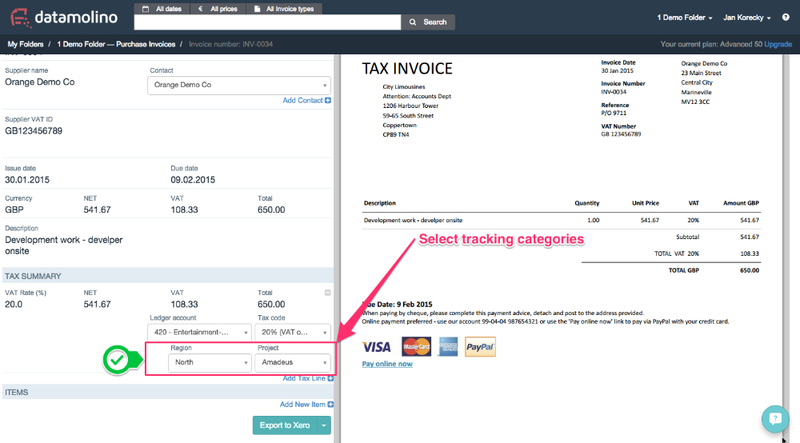 If you have tracking categories setup in your Xero, you can adjust the tracking categories for each transaction in the same way as you would when creating a bill in Xero. Tracking is a way you can slice up your accounts and view reports to see how specific areas of your business are performing. It provides a different dimension for reporting – as well as running reports based on where transactions are in your Chart of Accounts (e.g. rent, sales, travel) you can use tracking to create categories that match your business activities (cost centre, salesperson, region, department, activity etc). Tracking is optional. This does not mean more clicking for you. Datamolino always suggests the last tracking category that you have used with a certain supplier. You can change it only where you require. If you need to track the same suppliers for different locations, consider creating a folder in Datamolino for each location to make tracking easier.